Si vous vous trouvez au port de Santorin, profitez de l’île à votre guise grâce à une excursion privée et personnalisable de 5 heures en bord de mer en minibus de luxe. Retrouvez votre hôte à la descente du bateau au port de Fira et profitez d’une visite avec un itinéraire flexible. Vous pourrez explorer les ruines minoennes d’Akrotiri, visiter les hauteurs du monastère du mont Elias, aller dans les bars à flanc de falaise de Fira, visiter un domaine vinicole, ou admirer la vue de la caldeira de Oia. Explorez les lieux comme vous le souhaitez, et si vous le souhaitez, prenez le temps de vous détendre sur une plage magnifique de l’île de Santorin - À vous de choisir ! This was absolutely the best day of the entire 2 weeks we spent in Italy and Greece. We were on a Rome and Greek Isles Cruise and we had never ventured out on our own. We always felt that it was safer to take an excursion recommended by the cruise line because you are guaranteed to get back to the ship on time. 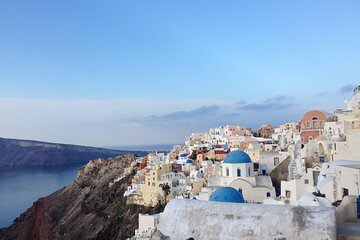 However, our cruise did not offer anything that excited us--we wanted to visit many places during our one day in Santorini. So, we decided to go with a Viator shore excursion and this was the BEST decision we could have made. Our guide, Fotis, was the absolute BEST!!!!! He took our list of all the things we wanted to see--Oia, the monastery and Mount Elias, the ruins, a traditional Greek lunch at a favorite spot for locals, and introduced us to some locals. Fotis was very aware of the time and had us back in plenty of time to wait one hour to catch the cable car and make it back to the ship in plenty of time. This excursion gave me the confidence I needed to use Viator in the future whenever we cruise. It is so much nicer to be able to go where YOU want to go and stay as long as YOU want--not be rushed with a large group. It was so personal--and we feel that we made a lifetime friend with Fotis. He made our day on Santorini the best of the 14 days!!! Thank you Viator, Fotis, and our personal driver! Did exactly what we wanted to do, and Alex, our guide, was fantastic! Would definitely recommend! Amazing! Helen was the best!!! We left feeling like we added another friend to our group! Thank you for such a memorable experience! The Tourist Bureau of Santorini and all the Tour Operators need to work together to eliminate the big buses used on the Island. I LOVE, LOVE, LOVE Santorini and I loved our Voator Tour. But I have spoken to too many visitors that would NEVER go back, including my relatives who visited with me on this last tour because of the traffic stoppage creaqted by the big buses not being able to pass on the narrow streets of the Island. The Island needs to get smaller buses, maybe on a 3 to 1 ratio, to replace the big buses. At least these vehicles will be able to pass and will not create traffic jams that last over an hour. If this does not happen, fewer and fewer people will visit and more people will leave with a bad review of Santorini. Other than standing for more than 1 and 1/2 hours, we loved our tour and our tour guide. As detailed on Viator, our guide Elissa tailored our tour to meet our needs. We had an hour on the beach and were able to tour the whole island. We also had time for lunch in Oia. Elissa was very pleasant and knowlegable. We had our own private van with our own driver. Definitely superior to a cruise sponsored tour. This was a very nice tour. Santorini has got to be one of the most beautiful places on earth. Our tour guide met us promptly at the designated meeting point. She and the driver took my family of four to all the highlights in and around Santorini. We had lunch outside at a beautiful little restaurant next to the black sand beach on the Meditranian sea. The tomato balls were my favorite. So delicious! The Greek beer was also very good. The scenery was amazing! I highly recommend this tour. Our guide was fantastic. Great driver and guide - comfortable transport, knowledgeable and made sure we saw all we wanted, tailored to meet our needs. Many thanks for a great day out - would definitely recommend as the best way to spend a day here.